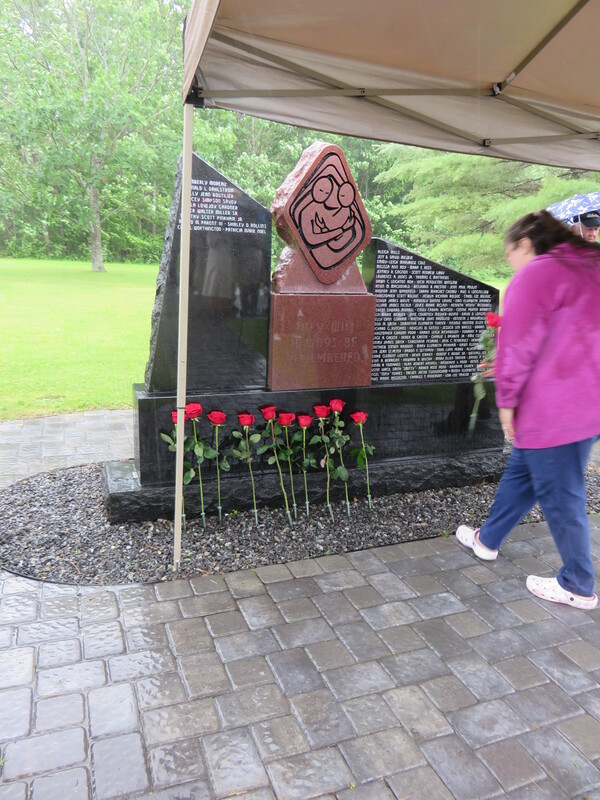 A POMC (Parents of Murdered Children Chapter of Maine) event was held on June 28, 2015. The day was a very cold rainy day. You could see reflections of people in the stone with their raincoats and umbrellas. 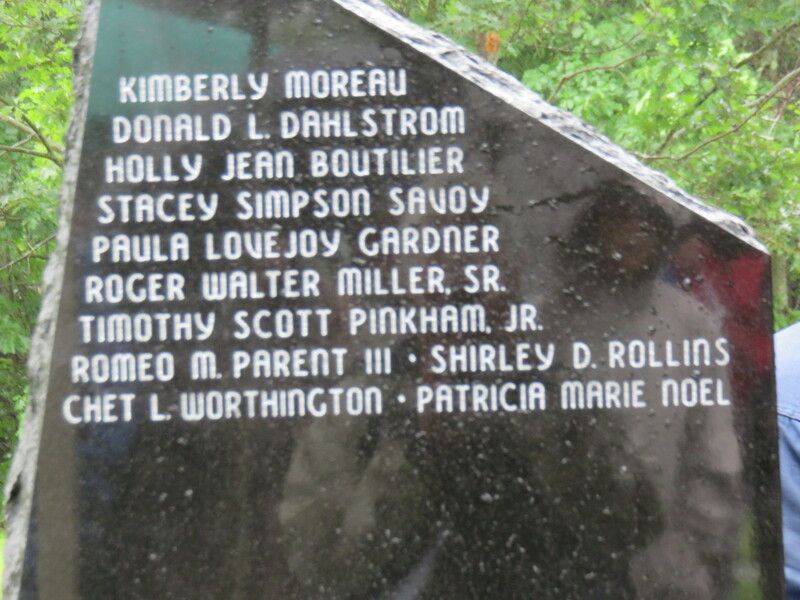 The event marked the adding of names for this year on the memorial plaque that was established last year in Maine POMC. Many were folks who lost someone many years ago and some with cold cases still. Our sister, Shirley D. Rollins (Tiny) was among the names added thanks to sister Nina Hodgkins who has been working with POMC and all siblings for a year to have this happen. It was especially meaningful to have everyone of her siblings in attendance, their spouses and several extended family members and friends. All of us coming from Virginia, Rhode Island, Florida and California and of course Maine. Our sister, Shirley Dianne Rollins, better known as “Tiny” is being remembered here today. When she was born, she hung to life as a preemie, so small they said she would fit into a tea cup. Today she would be 71. She only lived to the age of 17. She was murdered on December 8, 1961, just 6 days after our last photos were shot of her at my wedding December 2. I believe she would rather be known by how she lived her life then how she died. She was sweet, innocent and kind. She was known for doing kind acts without an expectation of getting something in return. She came from a family of eight children and she was the third daughter of the first born. I think she would beam with joy knowing how all her brothers and sisters expand her legacy by being generous to others in their own way. It is never too late. Murder leaves an impact that is indeed forever, so it is not too late, even more than 50 years since she died, to have this public acknowledgement of her here. Thank you, POMC for this honor and remembrance for those of us who became members of a Forever Club so long ago. All of Tiny’s siblings, their spouses as well as other extended family members and friends are with us this weekend. They all know of her inclusion here in this memorial and will help expand her legacy to our future generations. This is a difficult subject and Connie Saindon covers it carefully, with directness and compassion and a wealth of resources. Any family who is surviving the murder of a loved one will benefit from owning a copy of this book. It may need to be read in small doses, but comfort will be found in the shared experiences. Lots of stories from survivors–they are all different yet there is so much that is a common experience. I not only recommend this for counselors and families of survivors, but also for friends of those families. It provides so much insight and really provides some tools to help friends through the horror of murder. Very well done. I recommend it without reservation.